Hi friends! Excited to finally see some sneak peeks into my new house? Well, how about some pics AND a chance to win $100? Yeah buddy, this post is more exciting than Bachelor Tierra's twitching eyebrows. Last week, I shared some fun goodies that I recently found while shopping at Kirkland's. This week, I'm back to share what I bought and where it ended up in my new house! Meet my new office/guest room! Since I do a lot of my work from home, I've already set up my desk in the new office. I absolutely love that it faces a beautiful wall of windows. So much pretty light! 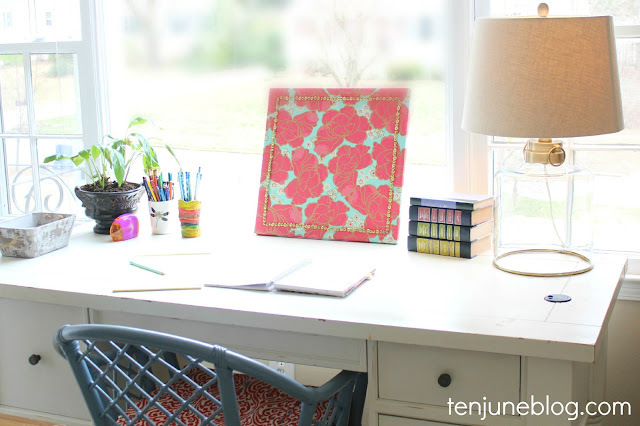 I set up my thrift store bamboo chair along with my desk and some fun accessories, including my DIY nailhead trim art. And do you notice one other fancy schmancy addition to my desk? Oh yeah. 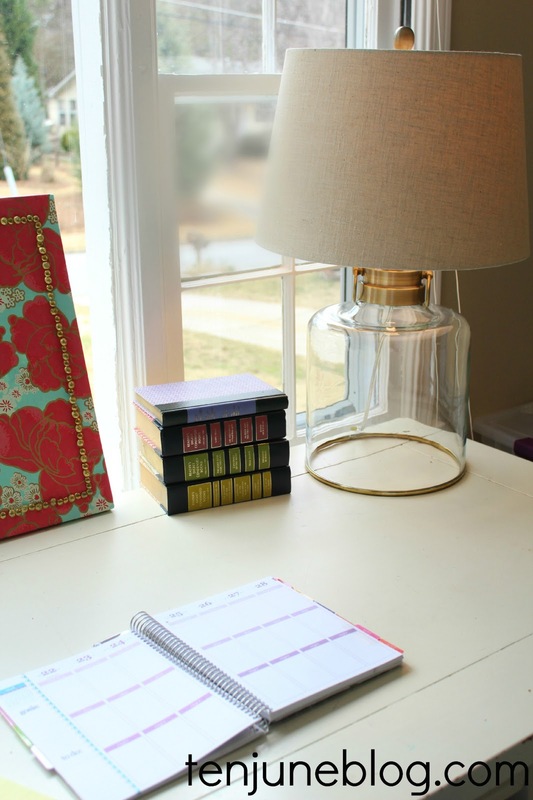 A new lamp from Kirkland's! The moment I laid eyes on this lamp, I knew it had to be mine. The brass, the linen shade, the glass drum, the brass, the brass.... it's the bomb dizzle. It's kind of large for a desk, but that way I get to sit and stare up under the lamp at this view all day. Love. Ok. Now which of you wants to win a $100 gift card to Kirkland's to put towards your very own bomb dizzle lamp? Or anything else in their store for that matter?! a Rafflecopter giveaway The giveaway closes at midnight on Sunday, March 3rd, 2013. Good luck! I received Kirkland's products for my Treasure Your Home blog post. Kirkland’s partnered with several bloggers like me to raise brand awareness in the month of February. All purchases and content are on my own accord and reflect my personal opinion and style. Kirkland’s blogger outreach policies abide by the WOMMA Ethics Code, FTC guidelines and social media engagement recommendations. For official Kirkland’s giveaway rules, visit http://www.kirklands.com/content.jsp?pageName=blogger_rules-03. 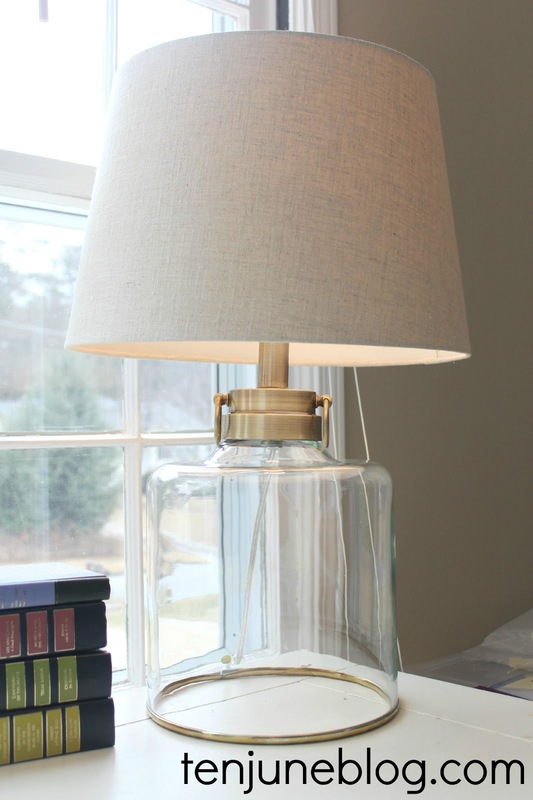 I love the Bronze Clear Glass Table Lamp. Thank you! I seriously LOVE Kirkland's! I found my family room curtains there, and I always find great gifts for my friends. The best part is that Kirkland's is less than a mile from my house. I really love that lamp too! Thanks for the give-a-way! 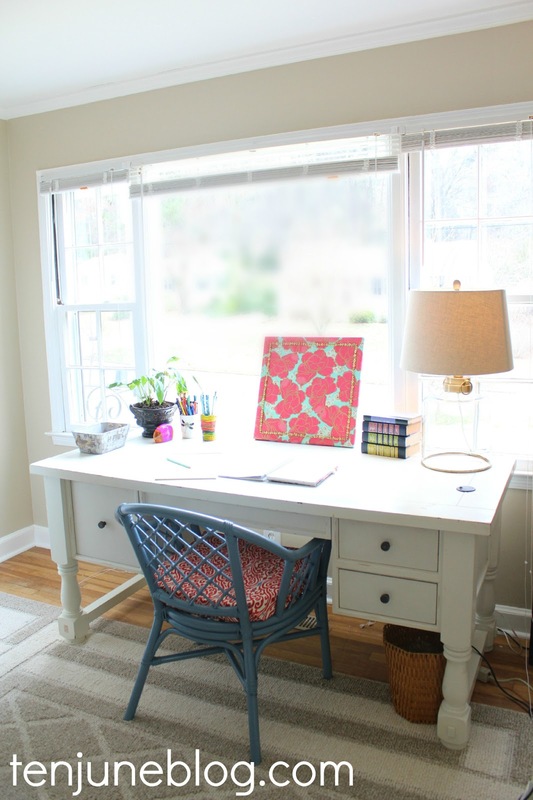 What a great space to get work done, Michelle! And with it facing the beautiful window you never need to worry about what the rest of the space looks like! :) Awesome lamp. I love the lamp you purchased! My husband and I are building our first home and it will be ready in July! I would love a gift card to purchase some new accessories for our new house! I REALLY love that lamp!! Surprised it's Kirkland's! I love the mason jar night light. And I saw your bathroom remodel pinned today from someone wanting to remove their tub! I love the Hexicomb decorative mirror! I'm starting to get a little obsessed with hexagons. New favorite pattern? I also LOVE LOVE LOVE that lamp of yours. I can only pick ONE?! Well, it'd have to be the Gray Elliot Console Table- SO CUTE! I love this log dresser! Love the lamp & the chair! Hope you are settling in well in the new house. Lookin' spiffy over there! Love that lamp!! I love the Tallia Metal Clock! MUST have the Natural Linen Torquay Accent Chair for my desk. I've been eyeing it and am saving my pennies. Love love love! i never thought i would love a lamp more than the leg lamp, but i think i might. I love the lamp - and how nice to be facing the window. I have been planning my home office lately and am still undecided where to put the desk. You look like you are settling in nicely to the new place! 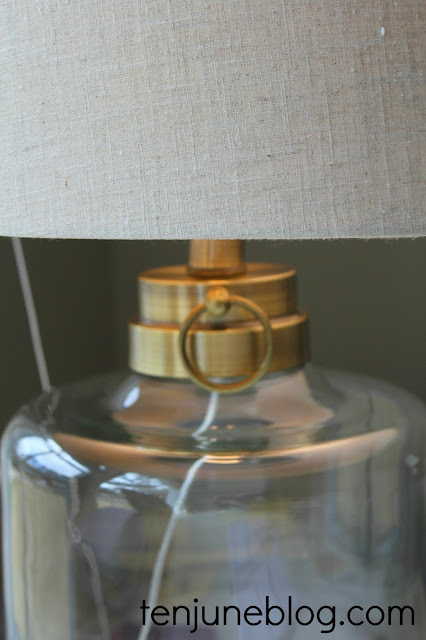 and those hobnail lamps are fun, too! I really like the Sadie Arch Mirror, but after seeing your lamp, I might be persuaded to get one of those instead! Um, I want that lamp! Times 2! I'm loving the Copeland Cabinet! That lamp is fab! I also love the Delia Full Length Mirror! So many great choices -- but I love the Kennedy Brown Faux Leather Tufted Bench! The metal Somerset Bakers rack is AMAZING!!!! Okay, thank goodness you showed the rest of your office. Sadly, it made me feel better about myself. haha I'm still unpacking and setting up after being in my house since November. I was about to be so jealous of your home already all setup and decorated. haha I LOVE the new desk space. It's fun and colorful!! That lamp is perfect. I also love Kirkland's new pillows - especially the Gray & Spice Ankara Pillow! I love the ottomans. I really need one for my living room. My favorite is the wood blue wine rack! Or the bronze clear glass lamp would do just fine! Love the linen accent chair!!! Love that you have your little oasis in the chaos! That lamp is awesome -- almost a little nautical! My favorite is the Tan Herringbone Storage Cocktail Bench! I want about 5 of their awesome wall mirrors! Beautiful office!! I really like the Eugenia area rug. I lOVE your lamp!! I also like the antique faux leather ottomans. Thanks for the giveaway! Your office looks fab! Really coming along quickly! Love the cable knit throw pillows and the Jute Linen pillows! Can't wait to see the rest of your new house! Lamp is so cool! Love it! I love the Spheria Wall Mirror. I seriously have to have the owl garden statue and canisters! Thanks for keeping it real! Hahaha. I love your desk! (Those windows are ridiculous!) Can we talk about that lamp? I love it. I have been lamp shopping a lot lately...and this is one of my favorites. My favorite is the Amber glass buffet lamp. I think two would look beautiful in my dining room! Thanks for the great giveaway! I want the Sand Dune table lamp really bad! Kirkland's has the most beautiful lamps! In their ad this week, I love the floor lamp with the textured shade! Love the Candice 8-pc. Comforter Set! I adore their decor! I'd love to get a light for above our fire place! I'm in the market for new nightstands. I really like the Beckett in black on Kirkland's.com. I'm in love with that lamp...gotta have it!!! Your office is so pretty and bright and I love that lamp. I'm also glad to see I'm not the only one who likes brass. I've gotten some funny looks while searching for brass to add to the living room. Love the lamp! 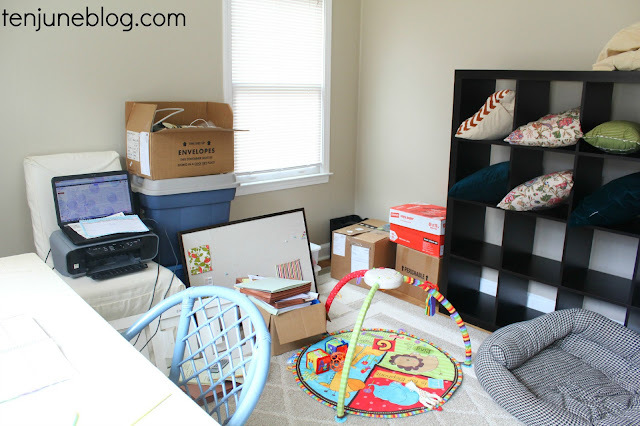 And thanks for the keepin' it real pic -- I moved a month ago and my sewing/office is still a mess with boxes piled high!!! I love the Orange Geometric Outdoor Cushion! I am in love with the Clarion Apothecary Jar Set! That lamp is so FAB. I might even take the same lamp! My favorite is the Beckett Gray Nightstand. Wow! Love everything! I'mm heading out this morning to see if my Kirkland's has any left! Great job girl!! I think my favorite item right now might be the black wine rack available. I also love a bunch of their throw pillows! I Love the lamp! I want one to live in my house! I love the taupe jute linen pillows! I love the dogwood blossoms II canvas print. I love the lamp too - just my style! Just came over from Anna and am a new follower of your blog. I'd like to invite you to my giveaway too - a pair of chic eyeglasses - come and have a look! I love the pillows on their site! I like the red Gatehill Curtain panels. Wait, am I the Colleen that won?